Finely crafted short essays masquerading as self-effacing jokes about writers and writing, in q&a form. 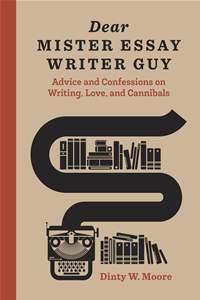 Dinty W. Moore (Between Panic and Desire), the editor of Brevity, solicited respected contemporary essayists for questions regarding the form, so he could answer them in Dear Mister Essay Writer Guy: Advice and Confessions on Writing, Love, and Cannibals. An essay riffing on the question at hand accompanies each q&a. The resulting collection of self-deprecating humor includes bits of writing advice as a bonus. Moore is rarely serious and keeps his tongue in his cheek throughout, but the result is enlightening as well as entertaining. With fewer than 200 pages, Dear Mister Essay Writer Guy is a quick and enjoyable read, to be taken in pieces as small as the reader prefers. Its witty, modest tone belies the artistry of the essays contained, which are exemplars of the short form. This review originally ran as a *starred review* in the August 28, 2015 issue of Shelf Awareness for Readers. To subscribe, click here, and you’ll receive two issues per week of book reviews and other bookish fun! Rating: 7 polar bears, naturally. Yes! I love quirky nonfiction! Very good. You will find a good bit of it here. 🙂 I’m a big Dinty Moore fan, check him out.